I came to Wild Flower this past weekend with a girlfriend and we had the most amazing brunch. We sat on the newly redone patio with our dogs. The server came out after we had settled in and brought glasses of water for my friend and I and filled a bowl of water for the pups to share. I ordered the Wild Orchid (so good!) and my friend got the Grand Mimosa. I was having a difficult time making a decision, everything sounded delicious, so our server suggested that I try the Tracy Trio. 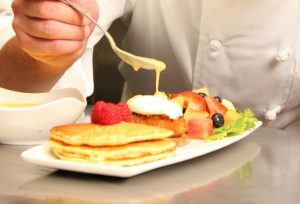 It comes with a specialty pancake, a Maryland crabcake, and a side of fresh fruit. It’s a bit of sweet and savory, and a great bang for your buck. My friend got the Wild Thing Scramble and absolutely loved it. The patio was pretty full but the service was still quick and not in a way that made you feel rushed. Our server was very attentive, making sure we had all that we needed and even made sure that the dogs’ water bowl was always filled. I would definitely recommend trying Wild Flower! Delicious organic plates. Breakfast and coffee at Wildflower are all you need for Sunday’s brunch! Great stop on a Sunday for brunch. Always helpful. Foods great. Service always good. Enjoy the West End, grab some French toast , a little fruit, and perhaps a mimosa. Loved the Bloody Mary Martini and the food was awesome! !